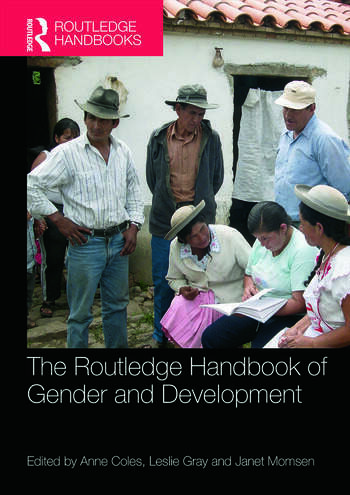 The Routledge Handbook of Gender and Development provides a comprehensive statement and reference point for gender and development policy making and practice in an international and multi-disciplinary context. Specifically, it provides critical reviews and appraisals of the current state of gender and development and considers future trends. It includes theoretical and practical approaches as well as empirical studies. The international reach and scope of the Handbook and the contributors’ experiences allow engagement with and reflection upon these bridging and linking themes, as well as the examining the politics and policy of how we think about and practice gender and development. Organized into eight inter-related sections, the Handbook contains over 50 contributions from leading scholars, looking at conceptual and theoretical approaches, environmental resources, poverty and families, women and health related services, migration and mobility, the effect of civil and international conflict, and international economies and development. This Handbook provides a wealth of interdisciplinary information and will appeal to students and practitioners in Geography, Development Studies, Gender Studies and related disciplines. Gender mainstreaming: changing the course of development? Serving the transnational surrogate market as a development strategy? Conflict and post-conflict- victims or victors? Women, camps, and "bare life"
Gender equality, women's empowerment and the UN: what is it all about? Development people: How does gender matter? Anne Coles is a Research Associate at the International Gender Studies Centre, Oxford University, UK. She was previously a senior social development adviser in Britain’s Department for International Development and has chaired two development NGOs. Her research interests include migration, people’s responses to harsh environments, and public health. Recent publications include Gender, Water and Development, Gender and Family among Transnational Professionals (as co-editor and contributor), and Windtower (2007, reprinted 2009). Leslie Gray is a geographer and Executive Director of the Environmental Studies Institute at Santa Clara University, USA. Her current research considers agrarian and environmental change in Burkina Faso and food justice in California. She has published articles on environmental policy, land degradation, and women’s access to resources in Burkina Faso and Sudan. This research has been funded by the National Science Foundation, Fulbright/IIE and the Social Science Research Council. Janet Momsen has taught at universities in the UK, Canada, Brazil, Switzerland, the Netherlands, Singapore, and the USA. She is Emerita Professor of Geography at the University of California, Davis, USA and was a Board member of AWID. She is currently a Senior Research Associate in the Oxford University Centre for the Environment, a Research Associate in the International Gender Studies Centre at Oxford University, and a Trustee of the development NGO, INTRAC. She has published over 170 articles in refereed journals and chapters in books and authored or edited 18 books.